The Partagas Lusitanias is a beautiful and powerful Habanos of Double Corona format, 49 ring gauge, 7.6” (194mm) long and comes in a box of 10 cigars. Perhaps the best among the double coronas. Its massive size is noteworthy and appeals to many Cuban aficionados. Its construction is perfect and let you enjoy all its flavors for more than 2 hours. 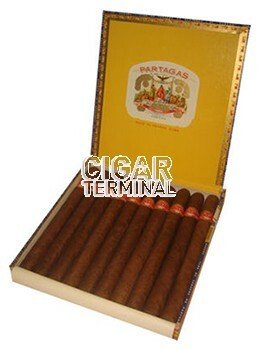 The Partagas Lusitanias is a real gem of a double corona. •	One of the most appreciated Double Coronas throughout the world. •	Giving yourself a Lusitania from Partagas is giving yourself the pleasure of smoking one of the best cigars in the world. Find an excuse to spare 2 hours to savor its flavor. You'll be glad you did. The Lusitanias is a sight to behold. The wrapper on this Lusitanias looks beautiful. It is on the dark side with hardly a vein, oily, hard to the touch with a slight box press and a perfect cap. The pre-light draw tells us it will draw well and give a light cedar flavor. Showcasing sweet notes with some cedar hints, and a pleasant deep spiciness. Even burn throughout and a mouth filling draw with billowing smoke. The aromas that stand out in the first third are spices and leathery notes. After the first few draws, the cinnamon and ginger flavors are joined by coffee and cacao notes. The cigar is very well balanced in terms of flavors. All the spicy flavors are in full blown by the end of the first third. The second third continues on the same path, with the addition of moist soil aromas that reveals the richness of the cigar. Many flavors start appearing, bitterness from coffee aromas, spice from cinnamon, sweetness from caramel. The burn is still perfect and the draw remains amazing as well. The final third is once again incredibly rich. The mixture of spices and bitterness is still incredibly there, with notes of Asian spices and bitter chocolate. Herbal touches also start appearing towards the end, and all that makes a cigar that is hard to put down. This gem delivers it until the nub. In summary, many aficionados claim this is the best cigar in the world, right up there with the Hoyo De Monterrey double corona.